Something has been stirring in the Northeastern state of Pennsylvania. 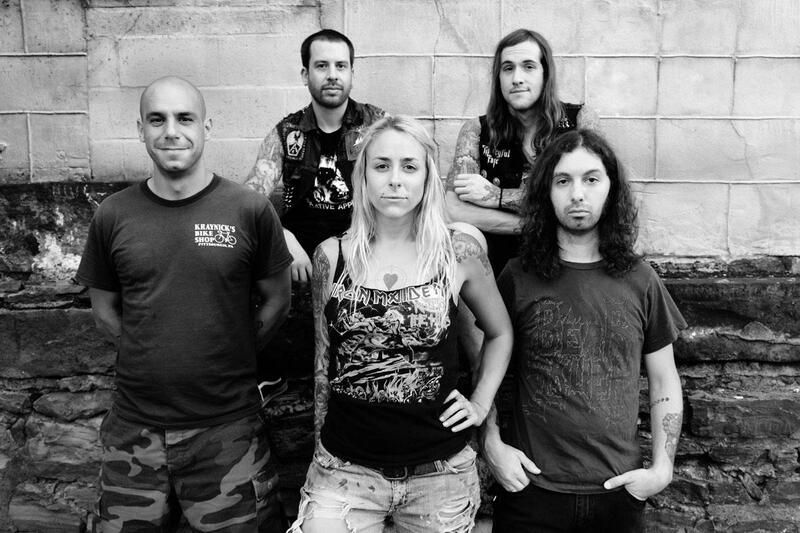 Pittsburgh traditional metal powerhouse Lady Beast has been steadily making a name for itself since forming in 2009 and releasing their namesake debut in 2012. “Vicious Breed”, their third album overall and first for Italian heavy metal specialist label imprint Cruz del Sur Music, is the culmination of years of hard work in both the studio and on the road. It is the product of a band whose career is experiencing a meteoric upward trajectory. 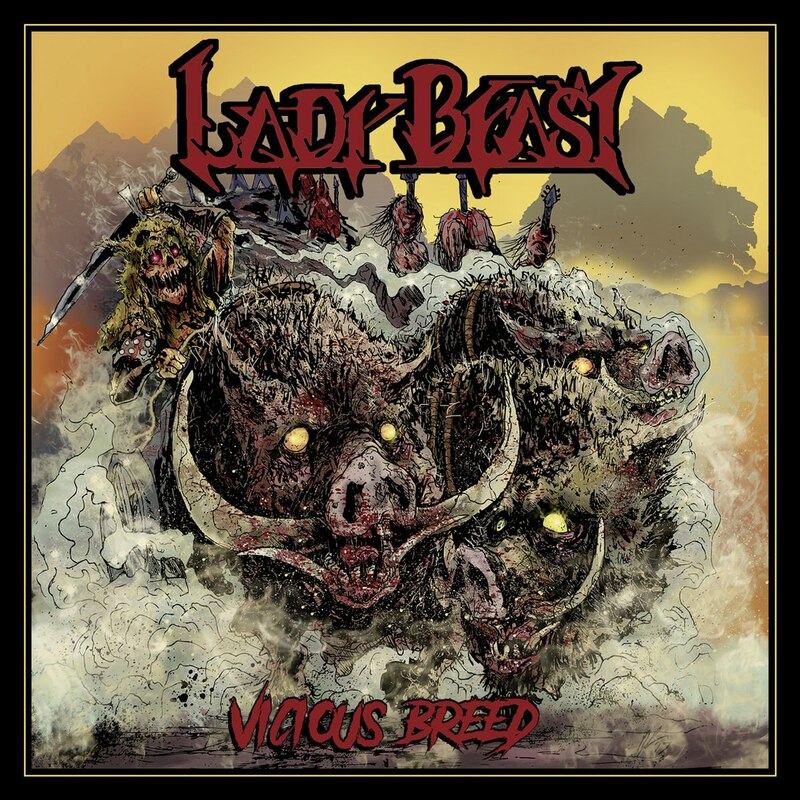 The time for Lady Beast is now and “Vicious Breed” is here to once and for all cement their status as North America’s most deserving traditional metal combo. Now with Cruz del Sur Music behind them Lady Beast is finally to roam free and pillage all over the world. Seal the Hex, indeed. If there was anything that “II” abundantly proved it was that Lady Beast embodied the best qualities of Iron Maiden (circa 1982-84) and the take-no-prisoners, spikes-denim-and-leather attitude of earliest Metallica. It isn’t as if Lady Beast isn’t in good company these days with the likes of Category VI, Savage Master and Elvenstorm. 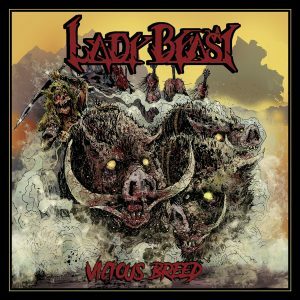 Lady Beast early on made a name for itself by being one of the more grittier, speedier traditional metal revivalists and that is only partially true on “Vicious Breed”. There’s a sense of sophistication to this album that was absent on their earlier two records. In certain aspects “Vicious Breed” is indeed the most vicious Lady Beast has yet sounded. On the whole it’s a far more deliberately paced effort where sheer speed and the whole retro angle is of secondary importance. It isn’t so much a progression from “II” either but more of a continuance without doing any concessions to the Lady Beast template. Lady Beast is still Lady Beast, even with “Vicious Breed” being more of a reserved effort. Lady Beast knows its strenghts – and will only bare its teeth and claws when it needs to. “Vicious Breed” is, above all else, all about efficiency when and where it matters. “Vicious Breed” abolishes the tradition opening with the closing track of the prior album. In fact the album opens in a way more akin to Category VI than to anything Lady Beast has done previously. The tempo is a bit lower compared to the past two records and “Vicious Breed” even is custodian to a power ballad of sorts with the touching ‘Always With Me’. ‘Sky Graves’ is probably the most epic Lady Beast has yet sounded. The five-minute instrumental opens with a riff sounding close to early Hypocrisy (and, likewise, Belgian doom metal veterans Insanity Reigns Supreme) and it soon explodes into the title track that is another Lady Beast anthem celebrating the rebellious nature of the heavy metal lifestyle. Since “II” Lady Beast for some reason has cut back on fantasy and mythology based tracks and “Vicious Breed”, perhaps fitting for a label backed effort, is a lot more grounded in reality on all fronts. In a lot of ways it is reminiscent of the band’s eponymous debut from 2012. What it does retain is the driving, pounding rhythm section (where most of the “Kill em All” Metallica influence is derived from) as well as the lightning-fast, fiery soloing and concrete, no-frills riffing that is the bread-and-butter of Lady Beast’s arsenal. “Vicious Breed” does indeed live up to its title even if it comes at the expense of “II”’s innate sense of epic storytelling, grand declarations of self-empowerment and larger-than-life imagery. And the best thing about Lady Beast? Debbie Levine, of course. This blonde (and occassionally war-painted) vixen has an electrifying and commandeering presence that elevates Lady Beast from a promising underground act to a veritable force of nature. Levine has that rare quality voice; commanding yet emotive, powerful yet soothing and with passion and expression to spare. Debbie can easily reach the high registers but only does so sparingly to maximize their effect. The record might not open with ‘Banshee’ but Levine certainly can scream like one. “Vicious Breed” is something of a step to the side instead of forward, and that’s perfectly okay. At no point did they promise a carbon-copy of “II” and the artwork reflects that sentiment. Not that the artwork for “Vicious Breed” is terrible by any stretch of the imagination, but it’s a definite step back from the fantasy art rendered by Mark Cooper for “II”. Imagine how a canvas from Ryan Barger, Johnson Ting, Robh Ruppel, Valentina Kallias or more established artists as Martin Hanford, Boris Vallejo, Tom Thiel or Julie Bell would elevate the Lady Beast visual aspect to a completely different plane than their competitors and differentiate them from the retro metal masses. 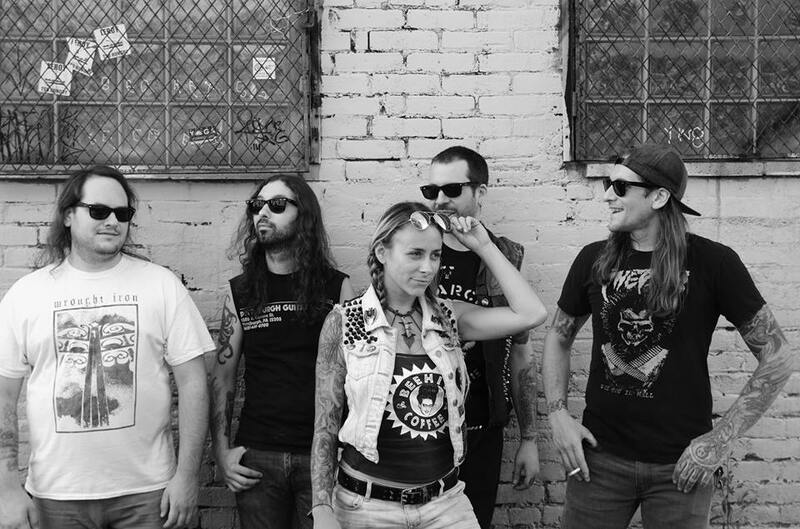 On “Vicious Breed” Lady Beast still does what Lady Beast does best. Which is giving traditional metal a much-needed injection of youthful adrenaline and enthusiasm. “Vicious Breed” is a tad more reserved than “II” but that doesn’t make it any less charming or effective. What would be truly interesting would be Lady Beast pushing their traditional metal into more aggressive, darker and malevolent realms. On the past albums they occassionally got violent and when they did they bordered into “Show No Mercy” era Slayer territory. To have them push that angle to its logical conclusion would be nothing short of blood-curdling. How we would love to hear Debbie and her men give the geriatric Californians a dose of their own medicine. And we’re looking forward to the day when that happens, that day the Pennsylvanians will lay waste to their competitors, foreign and domestic, once and for all. And with Debbie at the helm, nothing is stopping them. Every Giant Shall Fall, is what they say – and they’re right. Let the ferocious Lady Beast roam free!